11 second-year undergraduate Physics students learned how produce their own YouTube style videos in Phys FilmMakers course. Following a lab tour by a post-doc or PhD student performing research within UCL Atomic, Molecular, Optical and Positron Physics, students produced a short video based on this research, which was then shown in at a department-wide screening. The Phys FilmMakers course started when I received funding from UCL ChangeMakers in December 2015 to run a pilot course addressing the Connected Curriculum objectives within Physics and Astronomy. Having decided that producing videos on UCL physics and astronomy research was an interesting and exciting project, I asked scientific communicator Rebecca Coates what equipment she would recommend purchasing for a £500 budget. It turned out that she had experience in teaching physicists how to communicate science, including a course plan. This was the perfect opportunity to bring her YouTube and scientific communication expertise and enthusiasm together with my physics and teaching background to produce an innovative course. It was one of those optimal partnerships where we worked together to produce something far bigger and better than either of us had dreamed. The undergraduate students created videos on scientific topics after talking to UCL researchers about their research. A key element that distinguishes this from other video-making assignments is the involvement of science communicator Rebecca Coates, who was involved in all aspects of course design, lecturing and execution. The biggest difference it has made to students has probably been that they now feel a part of the UCL physics and astronomy community, connected to the incredible research and the people who produce it. In focus groups, students highlighted their increased scientific understanding and the way in which speaking to researchers about their current researchers provided motivation and contextualised their course content. They also gained important transferable and employability skills, particularly communication and teamwork. However, these skills were gained in an organic, enjoyable way. 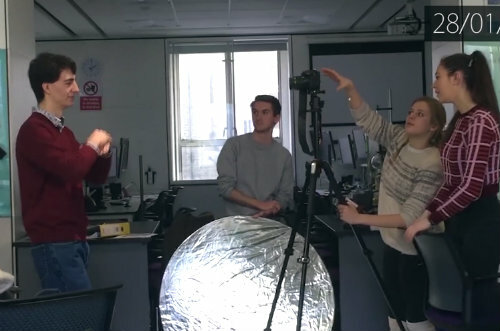 The Phys FilmMakers course is the focal point of a wider Phys FilmMakers programme aimed at publicising research within the Physics & Astronomy department via YouTube. Already, we have four videos promoting four different research groups; future courses and external work by our alumni and we will greatly increase the number of these videos in future. These videos fulfil a variety of outreach, publicity, widening participation (low socio-economic, female etc) and edu-tainment purposes that can significantly assist in enhancing the impact of the research in Physics & Astronomy scientifically and on the broader UK, European and global public. The Physics & Astronomy department has funded 15 second-year undergraduate students in 2016/17, as well as a course for 15 PhD students. Together with Physics Outreach Officer Sarah Hutton, we have applied for STFC funding for film equipment to optimise the quality of videos we are able to produce, particularly given noise and space restrictions of a working physics research environment. We are also working with five alumni (hopefully with UCL ChangeMakers funding) from the first course to prepare journal publications in the pedagogy literature, including an article in the UCL Connected Curriculum’s forthcoming Research = Teaching book. We also hope they will expand and promote the FilmMakers concept within and external to UCL and produce more fantastic videos for our new YouTube channel. Some of the students are even planning to prepare a grant application for a STFC Public Engagement Grant and we will certainly be helping them in every way we can to ensure the success of this grant.